You know that whole trend of 'will it waffle'? Where people put literally everything in a waffle iron and make mac and cheese waffles and gummy worm waffles and everything else in the world waffles? If you haven't, just type 'will it waffle' into youtube and knock yourself out with hours of videos of bacon being turned into a waffle. While I'm all for eating more waffles, no matter what they are made of, the far more pressing question on my mind lately has been will it funfetti? And in the case of lucky charms marshmallows being being baked into cake layers, the answer is oh yes. And I couldn't be happier about it. So here is some lucky charms funfetti, just in time for St. Patrick's Day and any other time you might need a super over the top ridiculous cereal based cake. 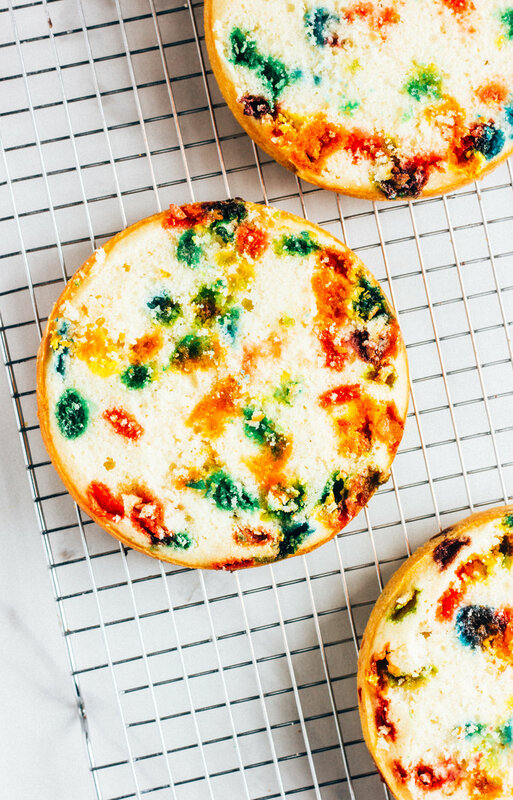 All of my funfetti love stems from one of my favorite bloggers, Molly Yeh, and her absolutely perfect funfetti recipe which is where the white cake portion of this recipe comes from. It's super fluffy, moist and extra vanilla-y (thanks to clear vanilla extract) in the way that only funfetti should be. And of course, no funfetti cake is complete without some major buttercream happening. In 99.9% of cake situations, I am a die hard advocate for buttercream that is not just butter and a snowstorm of powdered sugar. Swiss meringue buttercream all day, every day. Thanks. But the 00.1% of the time where I don't want that, exists for cakes like this. Putting european style buttercream on funfetti cake just feels wrong in so many ways. So I made an american buttercream and thinned it out with a couple splashes of cereal milk (made from Lucky Charms, obviously) and dyed it the most Lucky Charms shade of green I could find. Perfect for St. Patrick's Day or really any other day of your life that just needs a little funfetti. Note: This cake uses clear vanilla extract, which gives it that perfect fakey-vanilla flavor that screams funfetti. You can find clear imitation vanilla at cake decorating stores or order it online. I found mine at Michaels. -Preheat oven to 350. Grease cake pans and line the bottoms with parchment paper. -Sift dry ingredients into a medium bowl. Cream the butter and sugar until fluffy, about 3 minutes. Scrape the bowl and add the egg whites, one at a time, beating well after each addition. Beat in the oil and vanilla. -With the mixer running on low, add the dry ingredients, alternating with the milk, in three additions. Beat until the batter is smooth, but be careful not to overmix. Fold in the marshmallows. Divide the batter evenly between the prepared pans. -Bake 20-25 minutes, until a tester inserted in the center comes out clean. Let the cakes cool in their pans for 5 minutes before removing to a wire rack to finish cooling. -To make the cereal milk, combine the milk and cereal in a bowl and stir well. Let sit for 30 minutes, the strain out the cereal, pressing on the cereal to release any soaked up liquid. -For the frosting, beat the butter until smooth. Scrape the bowl and add the powdered sugar, vanilla and 1/4 cup cereal milk. Mix on low until the powdered sugar is incorporated. Increase the mixer speed to medium-high and beat until light and fluffy, about 5 minutes. Add food coloring in drops until the frosting is your desired color. -To assemble, use a serrated knife to level the layers. Brush the cut side of each layer with 2 tbsp. cereal milk and let the liquid soak into the cake. Fill and frost the cake with the cereal milk buttercream and decorate as desired. 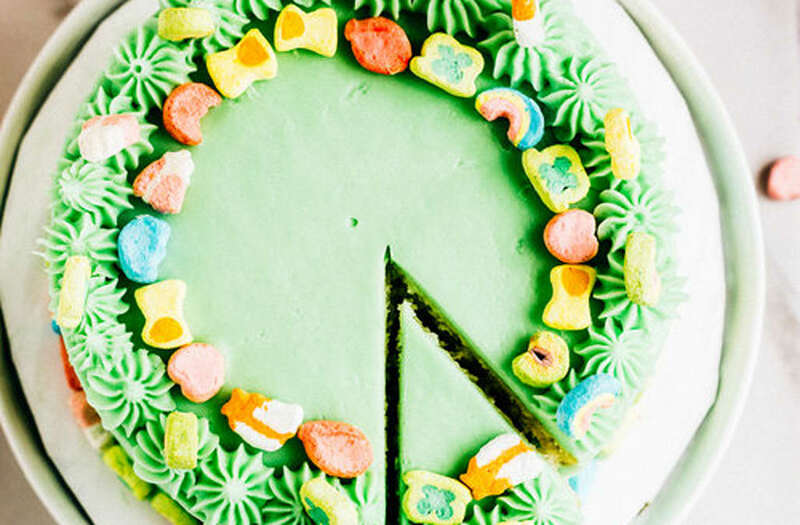 The post Lucky Charms funfetti cake appeared first on The Whole Bite. Even if you're not going to Ireland, you can still kiss the Blarney Stone this St. Patrick's Day: on a Blarney Stone cupcake, of course. Fortunately, it's not hard to make your own Shamrock Shake at home. If you have the supplies for a vanilla milkshake, plus extra essentials for baking, you have basically all you need to make the shake yourself.